On Jan. 25, 2017, Boeing showcased its newly designed spacesuit publicly for the first time. The suit was introduced by former NASA astronaut Chris Ferguson, who is now the director of Crew and Mission Operations for Boeing’s Commercial Crew Program. The Starliner crew will wear the “Boeing Blue” suit during the launch and re-entry phases of a mission. It is described as being 40 percent lighter than previously designed spacesuits, such as the Space Shuttle-era Advanced Crew Escape Suit (ACES). It was designed to protect the crew by providing functionality, comfort, and protection while traveling to and from low-Earth orbit destinations like the International Space Station. “Spacesuits have come in different sizes and shapes and designs, and I think this fits the Boeing model, fits the Boeing vehicle,” Ferguson said in a Boeing news release. ACES weight was 30 pounds (13.6 kg). Ferguson, who wore the suit during the Space Shuttle missions, said it was a bulky, heavy suit with thick neck rings. 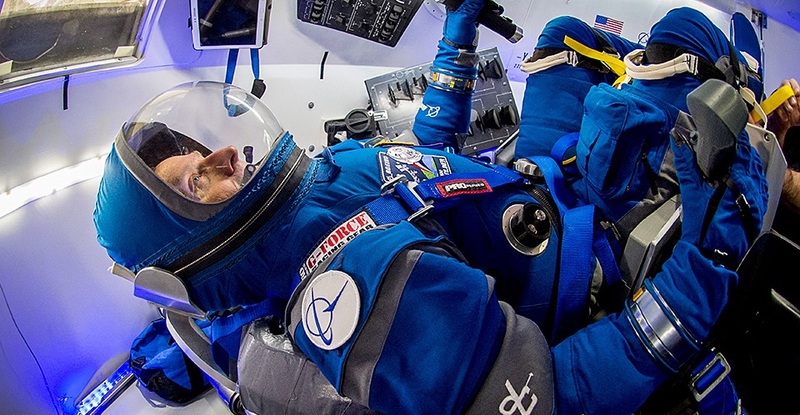 The spacesuit for Starliner’s crew weighs only 12 pounds (5.4 kg). In addition to an uncrewed and crewed flight test, NASA has ordered six Boeing rotation missions to the International Space Station aboard the Starliner, which will be the company’s first commercial human spaceflight missions. “We needed a suit that was air-tight. [And] could withstand the pressure differentials; could get the crew down from an extreme situation, rather it be a fire or a cabin leak,” Ferguson said. The new, reduced size helmet opens and closes with a zipper for convenience instead of latching like previous helmet designs. The Communications Cap Assembly headset is built within the helmet that connects astronauts with the ground and space crews during launch and return to Earth. The suit’s “hood-like” soft helmet has a wide polycarbonate visor to give the passengers better peripheral vision throughout their ride to and from space. The gas inlet and outlet valves are located on the abdomen of the suit for easy access where they are needed the most. The airflow diverter valve helps keep the astronauts cool and comfortable which allows water vapor to pass through the fabric of the suit instead of air. Zippers are also located around the torso area to make it easier for astronauts to transition between sitting and standing. Mobility joints in the shoulders and elbows allow for ease of movement while the suit is pressurized. “Underneath the shoulder covers, is material that we developed that provides pressurized mobility while also presuming unpressurized mobility,” said Shane Jacobs, Boeing’s Lead Suit Designer. The suit is described as featuring details such as the touchscreen-friendly leather gloves that astronauts would use while interacting with the CST-100’s tablet computers. There are leg pockets attached to the suit to hold a survival kit or personal items. The footwear was designed in collaboration with David Clark Co. and Reebok. Starliner is currently set to launch in 2018. Its crew will use a new access tower at Cape Canaveral’s Space Launch Complex 41 in Florida. The complex was previously used for non-crewed spacecraft, beginning with the launch of the Titan rockets in 1965 which was followed by the Atlas V in 2002 (now operated by United Launch Alliance). The historic space pad launched the Viking robots that landed on Mars, the Voyager spacecraft that have toured the outer planets, the New Horizons probe that completed its closest approach of Pluto in July of 2015, and the Curiosity rover currently on Mars.